The principle of MOVING BED BIO-REACTOR is to provide a continuously operating Bio-Film reactor; which is non cloggable does not require backwashing and has a very low pressure drop. This is achieved by growing the bio-film on small carrier elements that move freely in the waste water in the reactor. The air stream constantly keeps the bio media in suspension and at the same time provides the required oxygen to the biomass. The system uses specially designed Bio-Media, which provides a large surface area for biological growth. The Bio-media is made of plastic material, which has a very long life. The media is cylindrical in shape and provides a large surface area in the given volume. 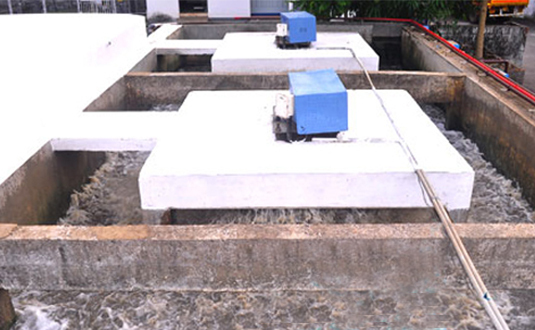 MBBR is a variant of submerged aerated filter technology. It provides a small footprint solution for carbonaceous, nitrification, C+N or in anoxic mode for de-nitrification treatment with very low capital and operating costs together with a low head loss. 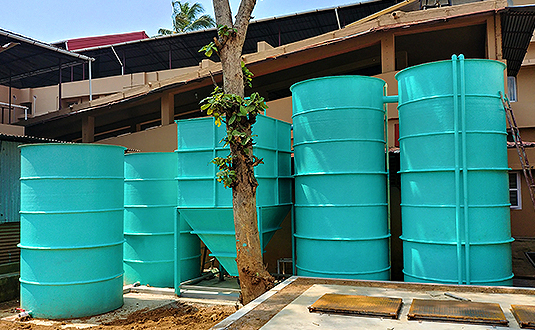 The MBBR Aeration tanks are two in number and are located adjacent to each other. Each tank will be provided with Aeration pipelines at the bottom, which will be in anti corrosive material and are manifold to cover the total periphery of the tank. Aeration tank is filled with a specific quantity of the Bio-Media, which is made of plastic material with a specific gravity just below that of water, to enable it to remain in suspension. The Inlet of the aeration tank is on the top with the waste water falling freely into the MBBR tank. The outlet is located on the opposite side, which has a perforated Screen mounted on it, which prevents the Bio-Media from flowing out of the MBBR Tank. Both compartments are connected to each other by openings, which has perforated sheets on each side. Micro-organisms grow on the surface of the plastic medium, feed upon the organic content of the waste water, and after a growth cycle, gets detached from the surface of the medium (peeling off). The detached cells are called Bio-Sludge. Water from the second MBBR along with the Bio-Sludge flows to a Flocculation Tank. 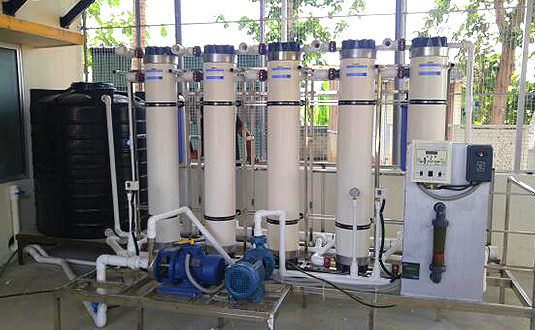 The Aeration System consists of 2 Nos. Air Blowers. One Blower shall be on duty while the other shall be on standby. The Blowers shall be used for aeration inside the MBBR Reactor & Equalization tank. A sequencing batch reactor (SBR) is a variation of the activated sludge process. As a fill and draw batch process, all biological treatment phases occur in a single tank. 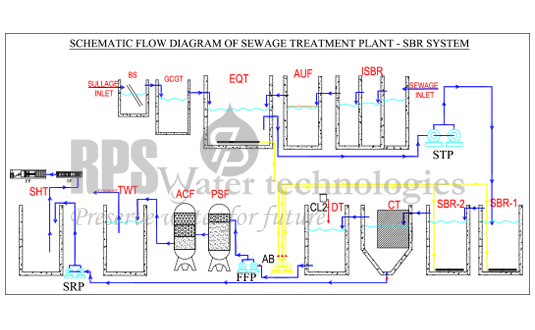 This differs from the conventional flow through activated sludge process in that SBR's do not require separate tanks for aeration and sedimentation. A SBR system contains both two or more reactor tanks that are operated in parallel, an equalization tank and final treated water tank. The type of reactor tank chosen depends upon the waste water flow characteristics (e.g. high or low volume). In addition SBR systems typically have no primary or secondary clarifiers as settling takes place in the SBR. There are normally five phases in the SBR treatment cycle: FILL, REACT, SETTLE, DECANT and IDLE. In the FILL phase, raw waste water is pumped into the reactor where it is mixed with the settled biomass from the previous cycle. Some aeration may occur during this phase. Then in the react phase, the reactor is aerated, allowing oxidation and nitrification to occur. During the settling phase, aeration and mixing are suspended to allow the solids to settle. 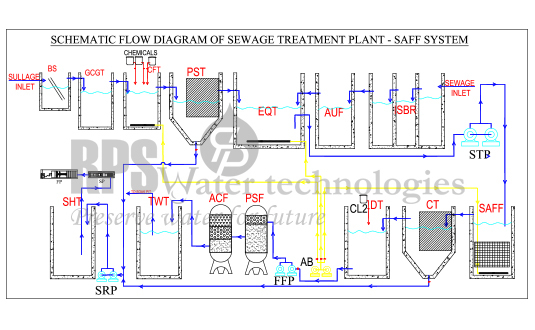 The treated wastewater is then discharged from the reactor in the decant phase, for tertiary treatment through Pressure Sand filters, Activated Carbon Filter and disinfected with Chlorine through metering pump. In the final phase, the reactor is kept idle as it waits for the start of the next cycle. During this time, parts of the solids are removed from the reactor and disposed of as waste sludge. Sludge wasting is an important step in the SBR process and largely affects system performance. The quantity and rate of wasting is determined by performance requirements. Sequencing Batch Reactors are suitable for areas with little land, stringent treatment requirement, and small waste water flows. While constant cycles with time-fixed process phases are sufficient in most cases, phases should be individually adapted and optimized for each plant. 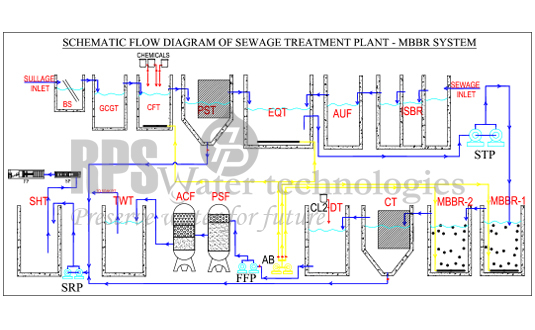 SBR is a fill-and-draw Extended Aeration System for sewage treatment. In this system, sewage is added to a single "batch" reactor and all the Equalization, aeration, and clarification can all be achieved using a single batch reactor. SUBMERGED AEROBIC FIXED FILM process is a combination of submerged Attached Growth and Activated Sludge processes. This system is designed to be installed into a two compartment, where the first compartment provides majority of BOD removal, and the second compartment polishes the BOD. Rigid block-type media is submerged within the treatment module, providing surface area for microbial growth. Bio Media used in the SAFF reactor are specially fabricated PVC media that aid removal of biological wastes from water. Bio Media are designed to achieve high surface area per given volume resulting in high specific mass transfer. The structure aids uniform growth of biological film. Micro-organism growth on the bio film converts the dissolved and 'unsettleable' colloidal impurities into a settleable biomass. Bio-Media has folded edges at the top and bottom that provide critical leading to resistance to mechanical damage and erosion. Bio Media have a long retention time and are minimum blocking. The equalised homogeneous Waste Water is passed to the Submerged Aerobic Fixed Film (SAFF) reactor & flows up through the fixed film media installed in the reactor. Air is supplied to the SAFF tank as fine bubbles, to aid the aerobic microbes attach to the media in converting organic matter (higher hydrocarbons) into simple end products. From the SAFF reactor the biologically treated Wastewater overflows into a Clarifier. As the water comes up through the Clarifier the sludge are retained & clear water overflows into the over flow chamber. The sludge collected in the hopper bottom of the clarifier will be periodically bled into the sludge well. A part of the sludge may have to be recycled to the SAFF Reactor for maintaining the MLSS in the reactor. The balance will be dewatered by means of a Biogas Plant / Filter press from which the cakes can be removed and used as manure within the premises. The Aeration System consists of 2 Nos. Air Blowers. One Blower shall be on duty while the other shall be on stand by. The Blowers shall be used for aeration inside the SAFF Reactor & Equalization tank. The definition of ZLD differs from industry to industry depending upon consumption pattern and the contaminants. The treatment depends on the intended usage of the recycled water. If the water is to be used for gardening purpose, BOD, COD and suspended solids removal with filtration will suffice. On the other hand if the water is to be used for high pressure boiler or for industrial production processes it's including pre treatment, Membrane filtration (UF & RO). The rejection of Membrane filtration will require Mechanical evaporation or mist evaporation is used to further concentrate the brine prior to crystallization. If any organic are present, condensate polishing may be required for final cleanup to reuse.